FOXG1. This is the Epilepsiome page on FOXG1, a gene for FOXG1 syndrome which was previously described as a congenital variant of Rett syndrome [OMIM#613454]. FOXG1 syndrome is an autosomal dominant condition characterized by microcephaly, intellectual disability and epilepsy. Thus far, disease-causing variants in FOXG1 have been reported in over 100 individuals. In a nutshell. A de novo pathogenic variant in FOXG1 was first discovered via fluorescence in situ hybridization and southern blot hybridization in a girl with severe cognitive disability associated with complete agenesis of the corpus callosum and microcephaly in 2005. The girl was found to have a balanced translocation of chromosomes 2 and 14, along with a neighboring inversion in chromosome 14q12. The inversion breakpoint on chromosome 14 disrupted a splice site for FOXG1, knocking out function of the gene. A few years later, FOXG1 variants were identified in two girls with early-onset seizures, microcephaly, and severe intellectual disability, which was described as a congenital variant of Rett syndrome. Congenital variant of Rett syndrome is classified as the same features of classic Rett syndrome, but with an earlier onset of symptoms. Since these original reports, variants in FOXG1 have been identified in over 100 individuals, including males. Figure. 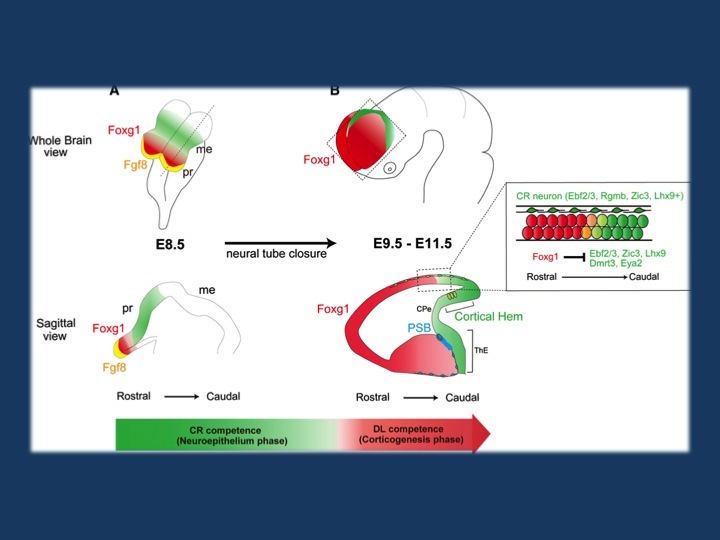 Proposed Model for the Switch in Neurogenesis in the Cerebral Cortex (A) Foxg1 (red) is induced in the anterior neural ectoderm through rostral Fgf8 expression (yellow) and expands caudally in the neural plate. (B) After neural tube closure, Foxg1 shifts the rostral limit of caudal telencephalic gene expression within the neuroepithelium (indicated in green) and initiates projection neuron production in the dorsal progenitors. Expression of these genes is only observed rostrally in migrating CR neurons. Note that the cortical hem corresponds only to the dorsal part of the CR cell competent region (green) in the sagittal section. Ventrally, the caudal limits of Foxg1 expression are the PSB and thalamic eminence (Pax6+ and Sfrp2+ region in Figure S7). CPe, choroid plexus; ThE, thalamic eminence; pr, prosencephalon; me, mesencephalon. Adapted from Kumamoto et al 2013 Cell Reports 3:931–45. Posted under Creative Commons license CC BY-NC-ND 3.0. FOXG1-related epilepsy. The phenotypic spectrum of FOXG1-related epilepsy is variable depending on the type of variant underlying the patient’s condition. Individuals with whole gene duplications of FOXG1 frequently present with infantile spasms, while individuals with deletions or truncating variants have later onset of seizures. The types of seizures caused by whole gene deletions, intragenic deletions or truncating mutations can include complex partial seizures, myoclonic seizures, and tonic seizures. There is no correlation between seizure type and deletion versus intragenic variants. The variability in the presentation of seizures was shown in two sibling pairs with the same intragenic variants, but discordant epilepsy severity in both families. Brain MRI studies have revealed hypoplasia of the corpus callosum, as well as simplified gyral patterns and reduced white matter volume particularly in the frontal lobes in some patients, even though the features can be variable. Development. The majority of patients with FOXG1 syndrome have severe to profound intellectual disability. Some of the features of FOXG1 syndrome are similar to Rett syndrome. However, FOXG1 syndrome usually presents with an earlier and more severe phenotype that includes severe developmental delay, microcephaly before 4 months of age, generalized hypotonia, and dyskinesias. Patients also frequently have sleep disturbances and bruxism. There is emerging data that the FOXG1 phenotype is more severe and can differentiate from patients with MECP2 pathogenic variants. Mutation spectrum. Fewer than 75 unique disease-causing FOXG1 variants have been reported in the scientific literature. The variant spectrum includes intragenic and whole gene deletions and duplications, missense variants and nonsense variants. Pathogenic variants have been identified in multiple exons and do not appear to be limited to one region of the gene. To view the variants that have been reported thus far, visit ClinVar. Genotype-Phenotype Correlation. Pathogenic variants in FOXG1 cause a phenotype of severe to profound intellectual disability with variable other neurological features. For example, the epilepsy phenotype may range from single seizures to epileptic encephalopathy and some patients do not have seizures at all. Virtually all patients have severe to profound intellectual disability and microcephaly. Infantile spasms in particular have been associated with duplications of FOXG1. Further studies are need to define the full phenotypic spectrum of other FOXG1 variants. Considerations for gene level interpretation. First, it is important to establish the strength of the evidence showing that the gene is associated with epilepsy. Some genes may only have one variant reported in a single individual with epilepsy, while other genes may have multiple variants reported in many large families with an autosomal dominant pattern of epilepsy. For FOXG1, there is moderate evidence for its role in human epilepsy. Considerations for variant level interpretation. When reviewing the significance of a variant, it is important to consider the impact on the gene and the presence of the variant in previously described patient and control populations. Many clinical genetic testing laboratories classify genetic variants into different categories, ranging from benign to pathogenic. Variants that are common in control populations and would not be predicted to have a major impact on the gene/protein are generally classified as benign. Variants are more likely to be classified as pathogenic if the variants are rare or not present in the control population, reported in multiple individuals or families with disease, and likely to have a higher impact on the gene/protein based on the type of mutation or functional studies. Variants with uncertain or limited available evidence may be classified as variants of uncertain significance (VUS), indicating that further information is required in order for the variant to be further defined. In some cases, testing additional family members can be helpful, as it allows the lab to determine whether or not the variant was inherited (versus de novo) and how the variant segregates with disease in the family. This is particularly true for FOXG1 variants, as most disease-causing variants would be expected to be de novo. Sometimes further classification of a VUS requires waiting for the identification of additional patients or families with similar or nearby variants. Inheritance, Penetrance & Prevalence. FOXG1-related epilepsy is inherited in an autosomal dominant pattern and is completely penetrant, so all individuals with pathogenic variants are symptomatic if untreated. Variable expressivity can occur, even with the same variant, particularly in age of onset, seizure type and degree of developmental issues. The exact prevalence of FOXG1-related epilepsy is unknown. Mechanism. FOXG1 makes a protein called forkhead box G1 which plays an important role in brain development before birth, particularly the telencephalon. The telencephalon develops into several critical structures, including the cerebrum, which controls most voluntary activity, language, sensory perception, learning, and memory. The disruption in normal brain development before birth, appears to underlie the structural abnormalities of the brain and severe developmental problems seen in individuals with FOXG1 syndrome. Recurrence risk & testing of family members. The majority of FOXG1 variants reported are de novo. Germline mosaicism of FOXG1 variants have been reported in a few families, making the recurrence risk for those families higher than the general population risk. FOXG1 syndrome has not been reported to be inherited in an autosomal dominant manner. Therapy. A specific therapy recommendation has not yet been proposed for FOXG1-related epilepsy, although individuals with FOXG1 syndrome may receive similar treatment to individuals with Rett syndrome. The current section on therapy is a brief overview, and, from the therapeutic perspective, does not represent a comprehensive review of the literature. It should therefore not be used for clinical decision-making without input from a health care provider with relevant expertise in the field. Research studies, patient registries, and family connections. The Epilepsiome team is happy to facilitate if you have questions or a specific interest in this gene. There are a number of groups/websites that provide relevant information and support for individuals and families with FOXG1-related conditions, including the groups listed below.